Every regulator contains numerous O-rings. These O-rings are critical to the regulator’s ability to function safely. Over time, these O-rings can dry out, oxidize, shrink and crack. This occurs regardless of whether the regulator is used or not. Each regulator first or second stage contains either a high- or low-pressure seat. As time passes, these seats harden and shrink. They become deeply indented by the sharp valve orifices against which they are constantly being pressed. This can cause a regulator’s intermediate pressure to “creep” and second stages to free flow. Therefore, even though a regulator may not have been used in the past year, these O-rings and valve seats may still need replacement if the regulator is to be able to perform safely. The longer a regulator goes without service — used or not — the greater this need becomes. Regulators that receive considerable use may require service more frequently than just once a year. Even with the most careful rinsing after dives, salt, sand, sediment and corrosion can build up on a regulator’s internal surfaces. Use also accelerates the deterioration of O-rings and seating surfaces. Some active divers, such as resort divemasters and instructors, have their regulators serviced as often as every three to six months. 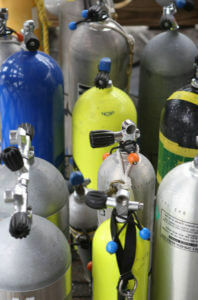 certification, then EACH manufactured scuba tank must pass a test before it can be sold. This is 100 percent inspection that even racing tires are not subjected to! It is somewhat equivalent to space specifications, so this is an extremely well-controlled industry! After the initial test, the results are stamped into the body of the scuba tank, along with the date (year and month) it passed. After that, the tank must be retested hydrostatically every five years. The test for each tank is on file at the DOT, and the testing station must contact them to obtain the correct test specification. A common hydrostatic test is to pressurize the scuba tank to 5/3 of its working pressure and to measure the flexing of the tank walls. Five-thirds of a 3,000 psi working pressure means that the tank will be pressurized to 5,000 psi. This is done by replacing the valve with a special hydraulic testing connection and filling the scuba tank with water under pressure – NOT air! Air would be too explosive if the tank were to let go during the test, as it sometimes will. Because water cannot be compressed, the tank cannot explode if it fails. Testing is done inside an armored vessel. The one my hydro station uses is sunk into the shop floor for added protection. The tank is also under water, and they measure the amount that a water column rises as the tank is pressurized. This measures the amount of tank expansion. The water inside does not expand, but the aluminum or steel tank casing certainly does! They are looking for tanks that DO NOT expand as much under pressure, indicating that their walls have been work-hardened over the years. Like a piece of steel that is repeatedly flexed, the tank walls get hard to the point that they may suddenly fail with a snap. This is EXTREMELY rare outside the testing station. When it DOES happen, it’s almost always fatal to people standing close by. You know it when they fail! When a tank fails during hydro, it’s usually the valve threads that let go. It sounds like a loud “whump” if you are in the building when one fails. The other thing that sometimes happens, but not as often, is that the bottom of the tank bursts open. This is due to corrosion. If the tank fails to flex enough during the test, it can never be filled with air again, and no dive shop will do so. It will not be stamped with a current test stamp (one within the past five years) and is “out of hydro” as far as any dive shop is concerned. One possible use for a failed tank is to cut off the bottom with a carbide saw (a lengthy process!) and hang it far downrange on a rifle range to be used as a gong. Will a dive shop ever cheat? Yes, it does happen. 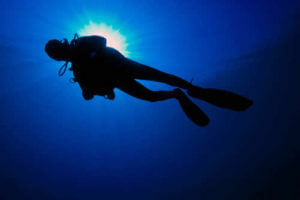 The few fatalities that occur usually happen at dive shops when shop operators fill out-of-hydro scuba tanks. So, in a cruel way, this is a Darwinian control over cheating! If you follow the rules, you are as safe as an airline passenger, and several times safer than any car passenger. I’ve been in three auto accidents in my life, but no airplane or scuba tank accidents – thank God! The annual visual inspection is performed by a dive shop. They let the air out of the tank and removes the valve to have a look inside. They’re looking for signs of corrosion and will refuse to put a visual inspection sticker on the tank if they find any. These stickers are paper or plastic and they stick to the tank. Every dive shop I have used has refused to fill a tank that has an out-of date inspection sticker. But they can do the inspection right there – the tank does not have to be sent to an outside party. They open the valve a little to slowly let the air out. This prevents condensation from rapid cooling. It takes 12 hours or more for a tank to bleed down – especially since airgunners seldom let their tanks drop below 2,000 psi. Let the dive shop bleed your tank for you; they know what they’re doing!